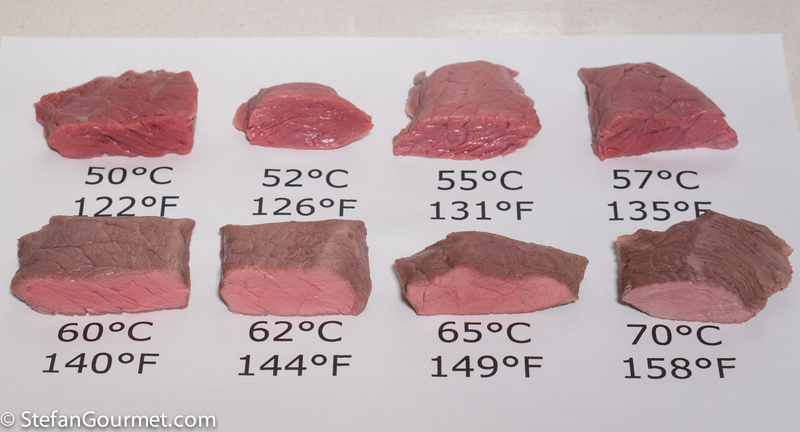 The same temperature chart also applies when cooking red meat in a pan, on a grill, or in the oven, when you use a thermometer to measure the core temperature. From 60C/140F and above, the myoglobin will break down, and since that is what makes the meat red, it will become less red. The higher the temperature, the faster this will go. But if you cook for long enough at 60C/140F, the color will be gone by just as much as when cooked for a shorter time at 70C/158F. You can read more about what cooking meat does to juiciness, tenderness, or the color in the series of articles that I wrote before. How did I produce these charts? I started with 8 pieces of rump steak from the same piece of beef. I vacuum sealed and labeled them, taking note of the initial weight. 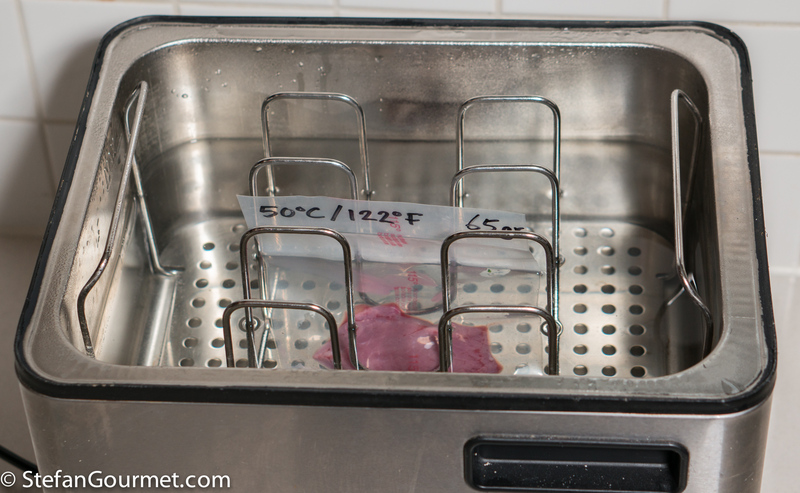 Then I cooked each one sous-vide for 15 minutes at the indicated temperature. Since the pieces of steak were only about 1 cm (less than 1/2 inch) thick, 15 minutes was enough for the core temperature to reach the target temperature. 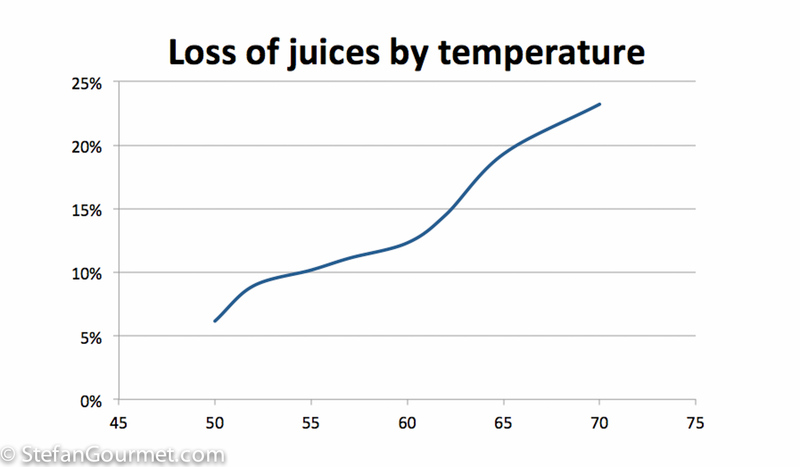 After cooking sous-vide, I weighed them again to measure the loss of juices. My favorite one was medium-rare, cooked at 55C/131F. I love these experiments of yours with the sous vide. And I presume you then need the very minimum in a sizzling hot pan to brown it. Where would you put bleu and saignant on this chart? Yes, but browning it will increase the cooking if you don’t allow it to cool off a bit first. Bleu is very rare and not in the chart (about 47C/116F). The pictures are really helpful – particularly as they’re all from the same piece of meat. What are your thoughts on the food safety aspect for such a short cooking time? For steak, I’m applying Archimedes’ technique (meat in bag underwater, not even sealed as cooking times are short). Vacuum in itself does remove juice from the meat – can you guess how much?